Last week's Third Annual Misprint Beard and Moustache Competition in Austin, Texas which was a huge success. There were 87 competitors, 900 screaming fans, and a line around the block to get in. 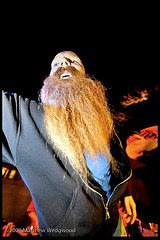 Pictured here is Allen Demling of the Austin Facial Hair Club, a local chapter of Beard Team USA, who took first in the "gnarliest beard" category. Meanwhile AFHC member Alex LaRoche won for the "best groomed beard." Past Misprint winner Bryan Nelson, AFHC's President and MVP, sat on the bench (in the judicial sense), serving as a judge so as to give others a chance. Besides, since the judges were allowed to accept bribes, judging was better than winning. The AFHC will be in Anchorage helping establish America as the premier power in world bearding. Misprint Magazine organized the competition and knows how to throw a party. Here's an excellent gallery of photos from the Mispritn.